Why is dignity of every human being important? The dignity of every human being is important as we are made in image and likeness of God and we are all his children. People who are poor, diseased or disabled shouldn't be treated differently to those who are middle class or rich. People are abandoned by loved ones and are to live on the streets on their own knowing that other people won’t help them. If the disabled, diseased and the abandoned were treated equally, they wouldn't have been abandoned by their family and they would receive help from others. People wouldn't have to experience being unloved by everyone or mistreated because of what has happened because everyone would respect the dignity of each other and try to help out. There would be less poverty and rejection of being unloved in the world and there would be greater harmony amongst others. How did Mother Teresa Help? 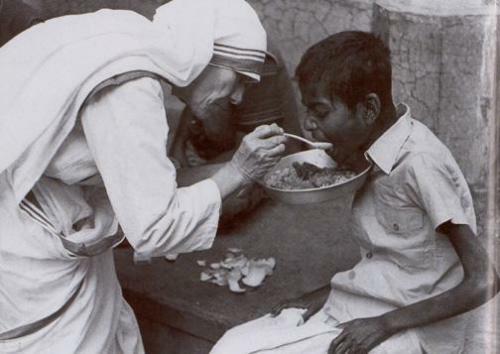 Mother Teresa helped restore the dignity of every human being who was abandoned, disabled or diseased in many ways. When she saw them on the streets needing help, she provided them food, water and shelter. She would collect left over food and feed them; she cared and nurtured the people showing love and compassion. She established the Missionaries of Charity which has centres all around the world with sisters and volunteers helping the poorest of the poor. She created hospices for the people to stay in where people would look after them and try enlightening them. She showed the people that they were not alone and that they always have God on their side as the love they share to their patients is the love God is giving to them. As well as the abandoned, diseased and the disabled, Mother Teresa also tried to restore the dignity of every human being by asking doctors in India never to perform abortion. She said that every life is precious to God (dignity of a human being) and if no-one wants the child, she would take the child, raise it and hopefully find them a home by getting the children adopted.